Not sure how useful this exactly is, but as of current, you're able to use toys such as Gnomish Gravity Well in Mac'Aree next to City Center. 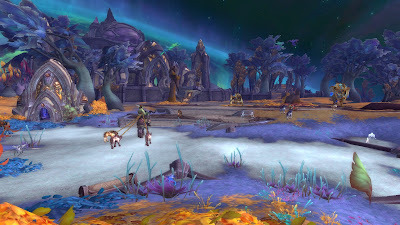 There is an area in Mac'Aree called Azurelight Square where such toys are usable. Paired with a freeze macro, I was able to use the Gnomish Gravity Well to gain infinite height and glider to reach normally unaccessible areas such as on top of the Vindicaar or the mountain terrain with the tricky textures in Mac'Aree. You can also use X-52 Rocket Helmet. There might be more items or toys you can use here, but this is all I've found so far. Good for anyone who wants to explore I guess. There might be other areas in Argus that allow the same thing, but I haven't checked. Hopefully there are more areas though to open up more possibilities of exploring.